A leading UK supplier of snooker tables / pool tables / bar billiard tables. Hubbles are proud to have been supplying quality snooker tables for over 100 years. We specialise in taking time to match your requirements for a snooker table of your choice. If we haven’t got one in stock then we can make one. Please check our galleries (see above “WHAT DO WE DO”) to view a small selection of what we can achieve. We have made snooker tables for Sir Richard Branson, David Suchet and the Gallo Family in Nappa Valley. We can make, pack and export snooker tables to any destination from No Mans Land, the Napoleonic fort in Portsmouth Sound to Necker Island in the British Virgin Islands. We recently worked with Penelope Keith and Paul Martin on the restoration of the the Billiard Room at Avebury Manor and this was featured on BBC Television. Some pictures of us restoring the billiard table are here. Our intention is to supply a table you will be proud of at a price you will be delighted with, on time and with no fuss. I am third generation with over 40 years of experience and am able to supply any style or design of snooker table, pool table, billiards table or bar billiards table. There are any number of pool tables available and of course we are happy to supply. Our strength is supplying the more individual pool tables as you will see in our POOL TABLE GALLERY. Look at our pool tables then please call us to discuss your bespoke pool table. We also offer a full recovering and maintenance after sales service. We specialise in the manufacture of all types of pool tables, pool dining tables & pool diners. In 2010 we celebrated 100 years of trade as a family. During that time we have seen enormous change and have gone from a general sports retailer to a specialist Billiard & Games Company. We specialise in the manufacture of all types of Snooker Tables including Snooker Table Diners / Snooker Dining Tables / Custom Made Snooker Tables / Bespoke Snooker Tables, Snooker Tables. Bar Billiards is a game that dates back to France and came to the UK in the 1930s. We specialise in the renovation and supply of all the antique bar billiard tables. However, people are now asking for more contemporary bar billiard tables for their homes. Visit our Bar Billiard Table Gallery and look at some of our work then call Peter on 07711 723677 to discuss your bespoke / custom bar billiard table. Contact us for all types of Antique Bar Billiard Tables, Custom Bar Billiard Tables & Bespoke Bar Billiard Tables. If you already have a table and need it restored, we would be delighted to quote. We are happy to collect, store and renovate and install any table that you buy privately. We renovate and restore all antique billiard tables, antique snooker tables, antique pool tables & antique bar billiard tables. 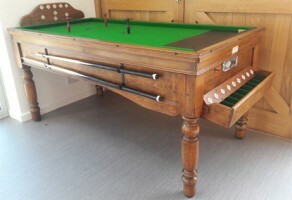 More recently with customers buying tables on EBay and other auction sites, we are asked to collect and restore billiard tables for them which opened up another avenue. We are also pleased to repair and re-tip snooker and pool cues. As ex Wimbledon Tennis Stringers, we also offer a very specialised racket stringing service. If you are looking for snooker tables for sale, billiard tables for sale or pool tables for sale, Hubble Sports offer an expert service in many countries. Should you require a bespoke snooker diner, billiard dining table even, we can supply the tables to you for installation at your location. If you are looking for snooker table diners for sale, a snooker dining table or snooker diners in general, Hubble Sports can help. Should you require a bespoke snooker diner or custom snooker dining table, we can supply the tables to you for installation at your location ( and can quote to install also if required ). If you are looking for pool table diners for sale, pool dining tables or pool diners, Hubble Sports offer an experienced, expert service in many countries. Should you require a bespoke pool diner or custom pool dining table, we can supply the tables to you for installation at your location ( and can quote to install also if required ). We stock many snooker tables for sale and also billiard tables and pool tables for sale.